MEAN WELL DRC-40 and DRC-60 series, which are already in the market, have been widely utilized in the security field, receiving outstanding market feedback and highly positive customer evaluation. In order to fulfill the demands for higher power from the security industry, MEAN WELL has extended the wattage available up to 100W and is pleased to unveil the highly reliable DIN rail type security power DRC-100 series. This product is suitable for assembly on TS-35/7.5 or TS-35/15 industrial rails inside cabinets. DRC-100 accepts 90~264VAC input, offering 13.8VDC and 27.6VDC output voltage models, makeing it suitable for use with commonly used 12VDC and 24VDC batteries. 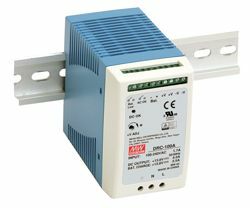 With DRC-100 Series users are able to build security systems with DC UPS function easily, especially for applications which need to operate normally under AC power failure situations, such as security systems, emergency lighting systems, alarm systems, DC UPS systems, central monitoring systems, access systems, etc.